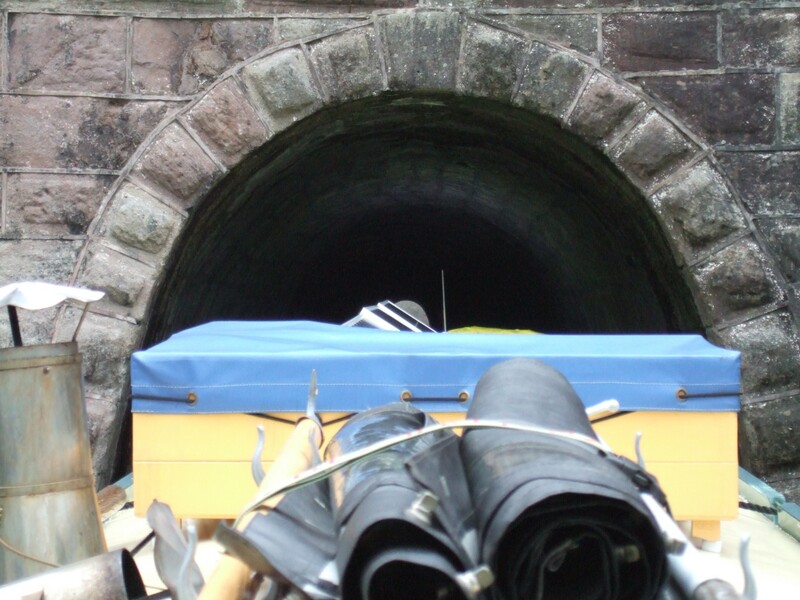 After a weekend of wet and windy weather we set off early to tackle the Harecastle Tunnel. 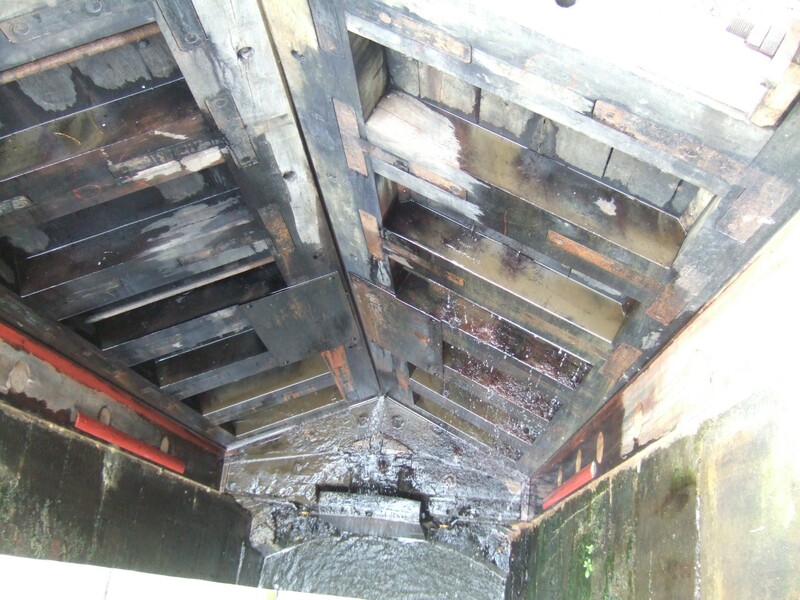 We had already stripped the roof of the boat of items that may have caused a problem due to height. We were met by a very friendly tunnel keeper who gave us written instructions and went through the emergency procedure. We were the first to venture through, with one boat behind us. Entered the tunnel by the south entrance. Once in the tunnel the light fades quite quickly, and we were glad our tunnel light lit up the whole area in front of the boat. The fans start their droning noise, and the whole place takes on an eery feel. There were originally 3 tunnels built. 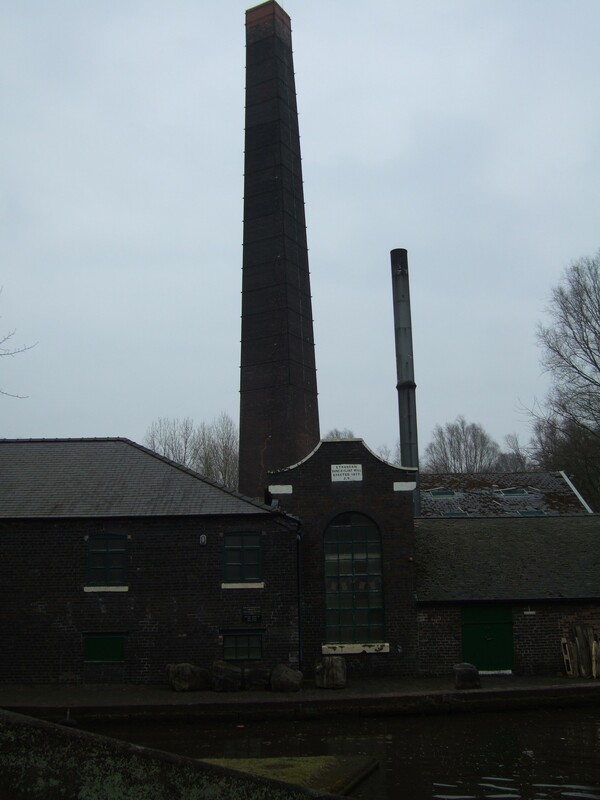 The first by James Brindley that took 11 years to build and was finished in 1777. 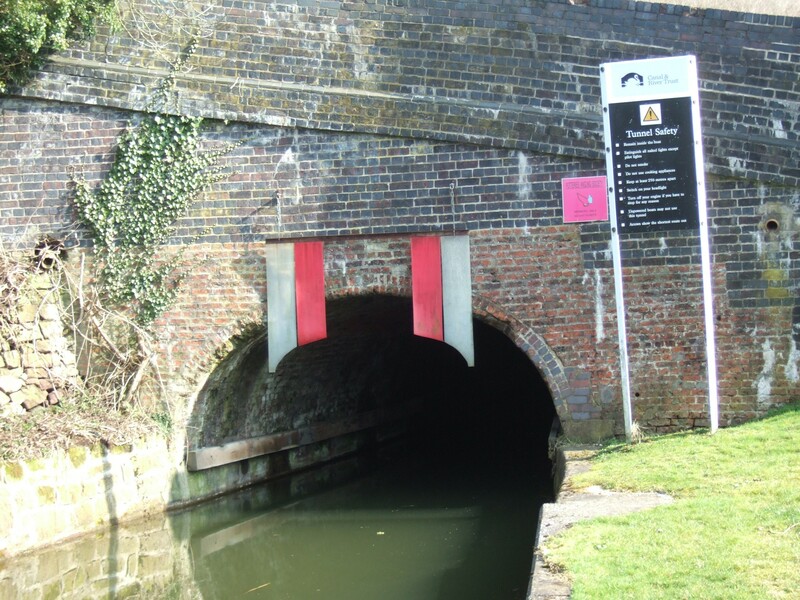 There was no towpath in the tunnel so horses had to go over the top, and the boaters legged the boats through. 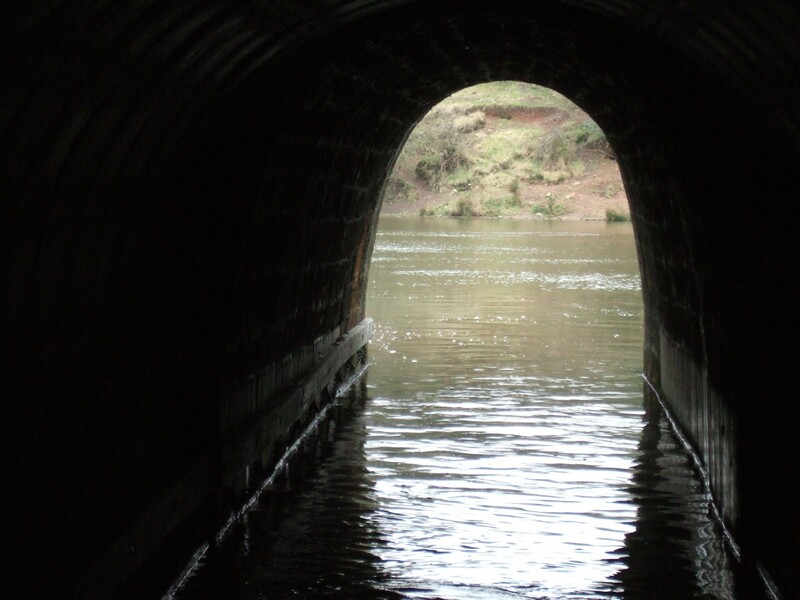 This proved to be a slow process and caused a bottleneck of traffic so in 1822 the T&M canal company called upon Thomas Telford, who recommended a second tunnel be built alongside. This took 3 years to complete and opened in 1827. 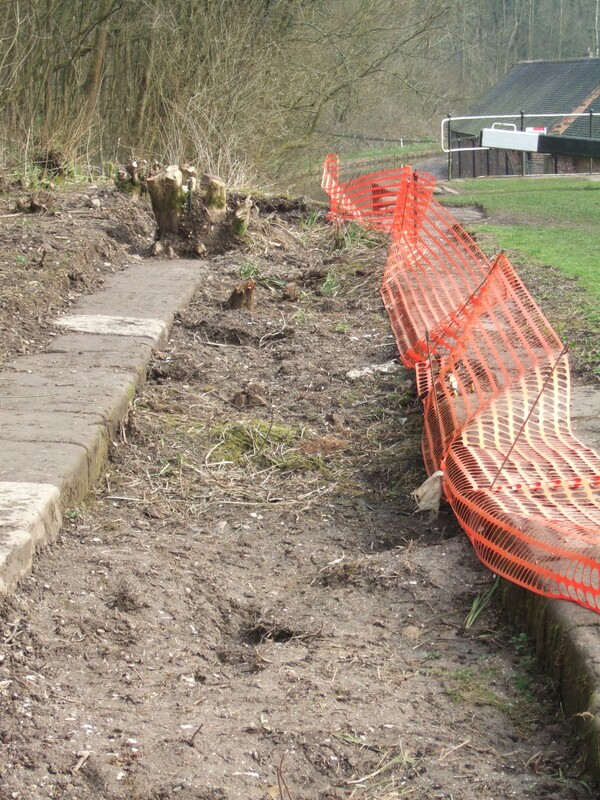 It originally had a towpath, but this has since been removed. 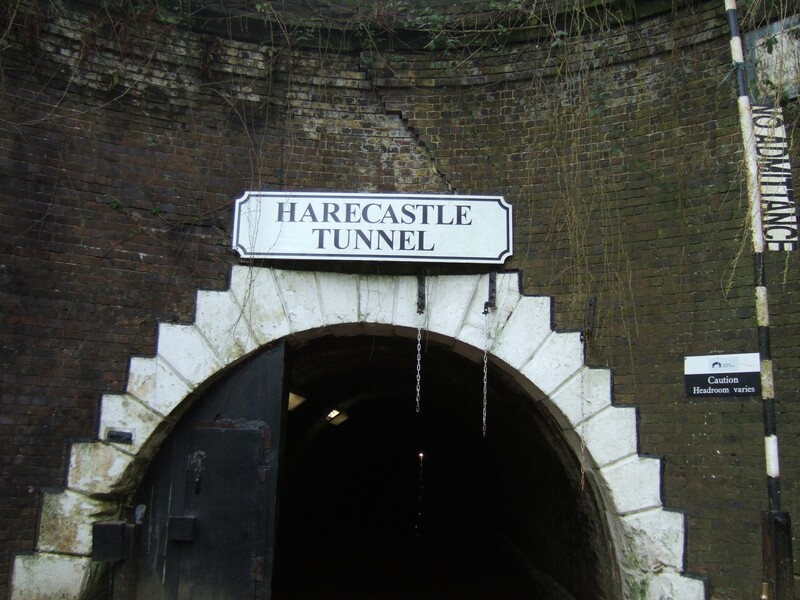 It is the tunnel in use today. 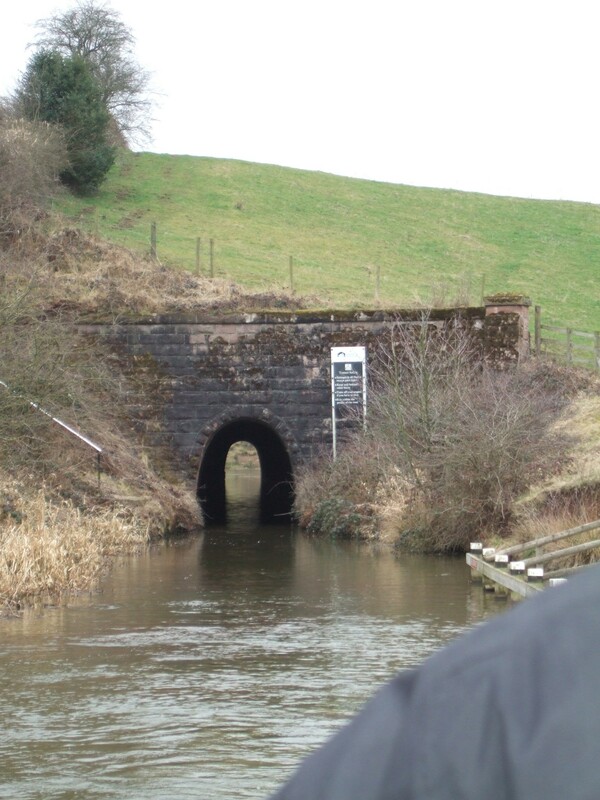 The third tunnel was for a railway line, but was closed in the 1960’s. 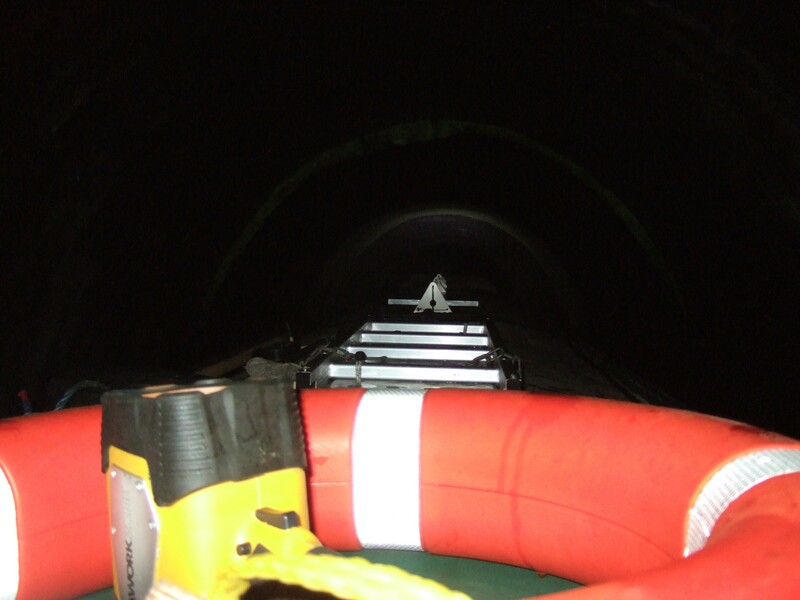 The tunnel is 2926yds long and it took us 37 minutes to get through. The north portal entrance, where we exited. The experience of the tunnel was not as bad as expected, though wouldn’t want to get stuck as some parts are very low. We were met by double locks. 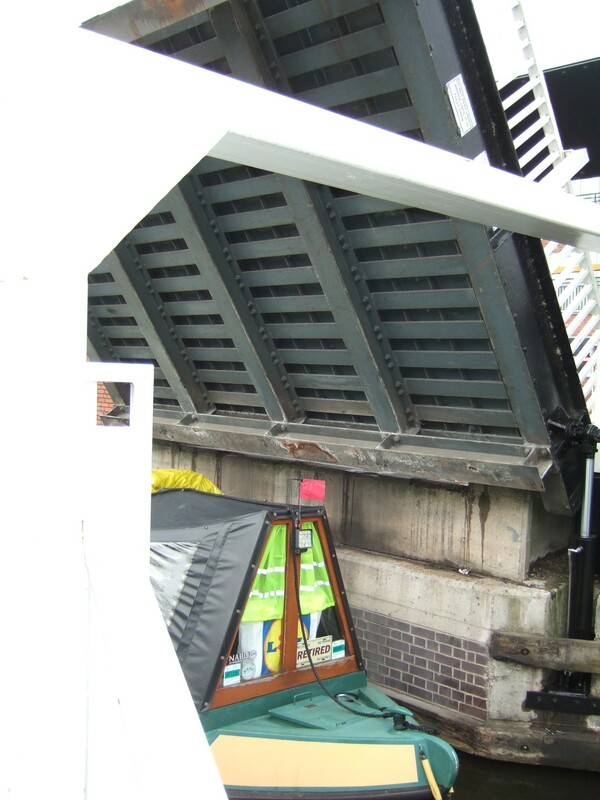 These were designed to ease the flow of canal traffic back and forth. Either can be used. 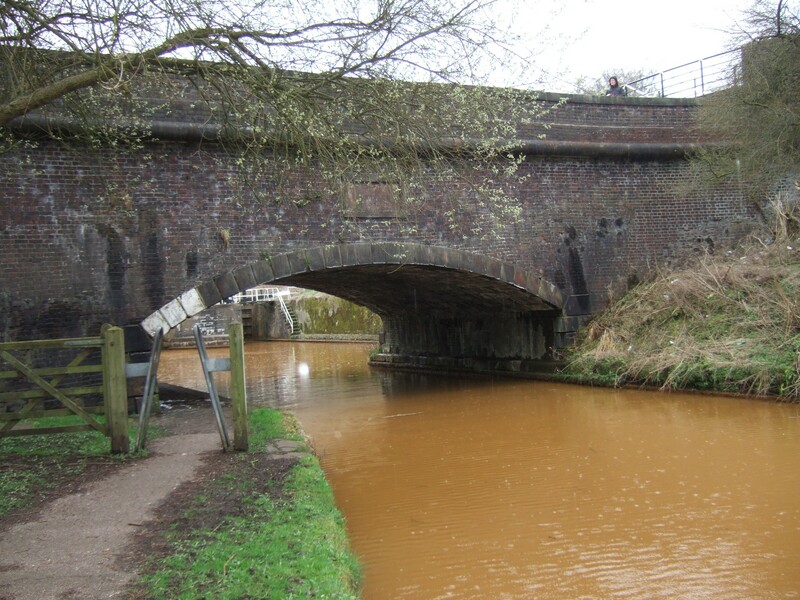 The Poole Aqueduct that carries the Macclesfield canal across the T&M. 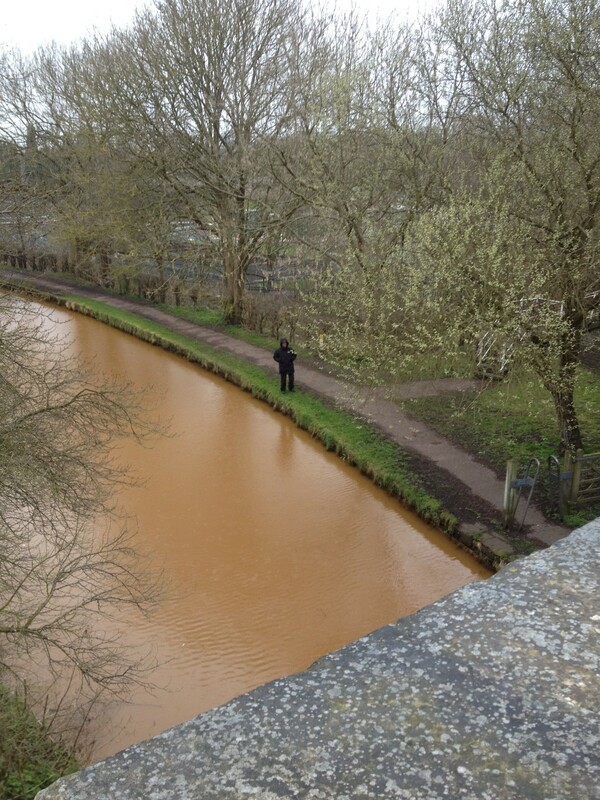 Standing on top of the aqueduct on the Macclesfield. View from the aqueduct of the T&M going north. Moored just before the aqueduct. The weather forecast is dire for the next two days with strong winds forecast. Did some top up shopping in Tesco’s. We plan to stay here (no restrictions) until the weather improves; meanwhile have contacted Cornwall to get some post sent whilst we wait. 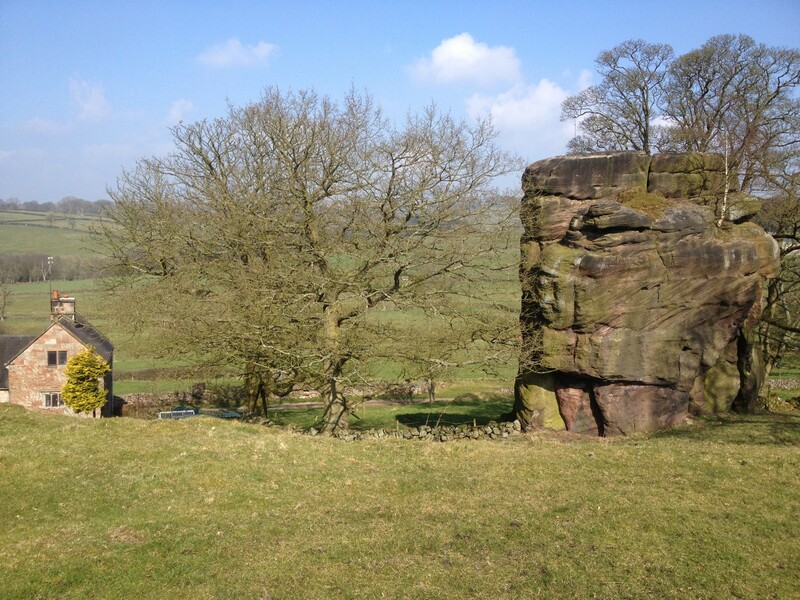 We left Cheddleton on Tuesday and made our way back to the T&M before the Easter holidays begin. 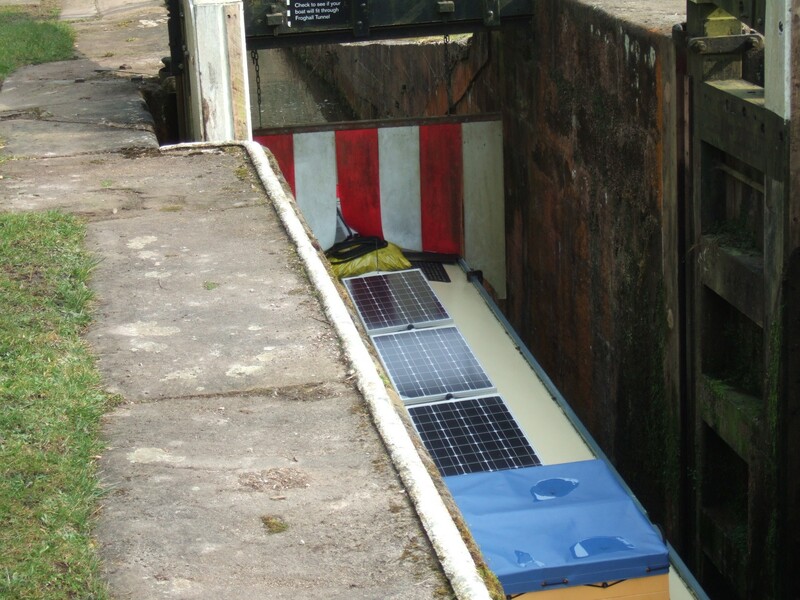 On the way through one of the low bridges caught us out and we nearly had a solar panel disaster. Luckily Charlie managed to stop and sort it out. One if the brackets is now bent but otherwise all ok. We moored at Endon after filling with water etc as the visitor moorings were clear this time. 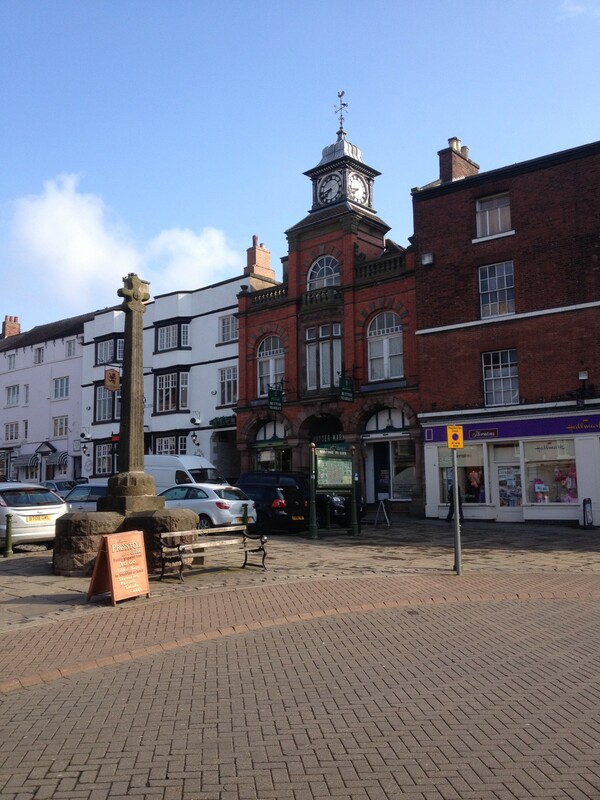 We stopped at Milton for shopping and I managed to get a haircut (just as well as it was getting long), then proceeded to Etruria to the junction with the T&M. 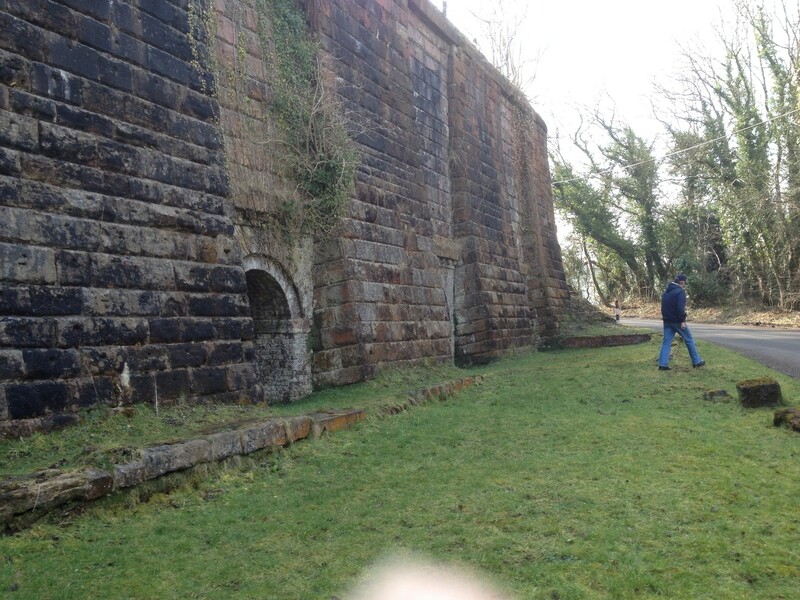 Another sanitary station stop at Etruria then we made our way along the T&M to Westport Lake. 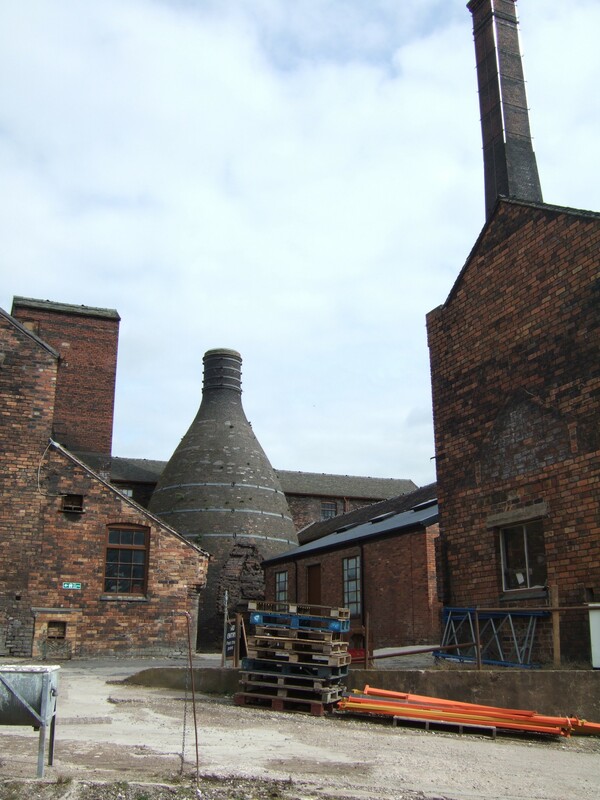 We passed many pottery buildings along the way. Not a very attractive area but full of industrial history. Some buildings had fallen into disrepair and looked very unsafe. 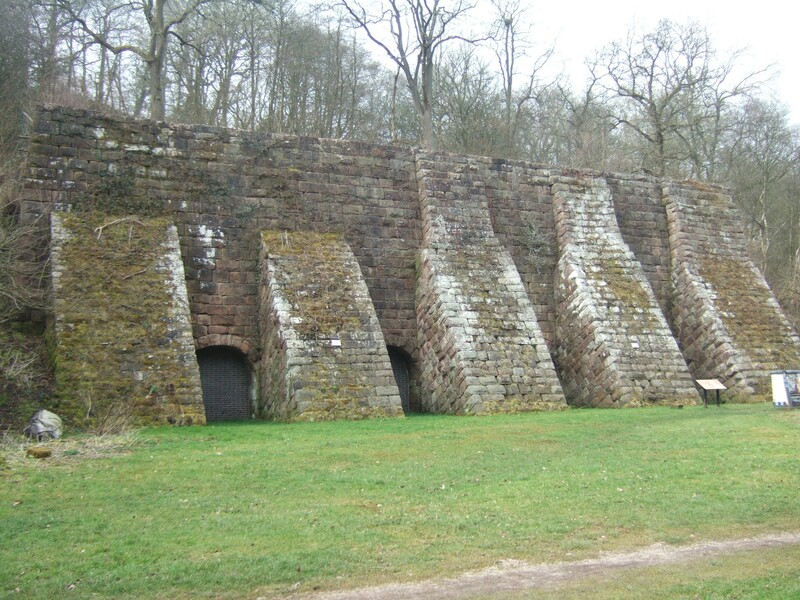 There are also some different shaped kilns along this stretch. 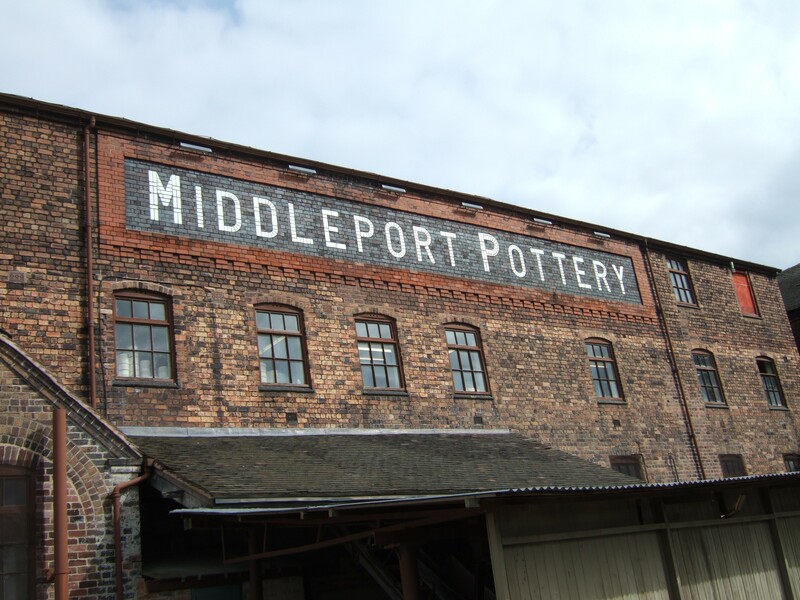 Middleport pottery is still in production, with cafe alongside the canal, a visitor centre and factory shop. When we moored st Westport lake the cheese boat passed. We couldn’t miss the opportunity for some lovely cheese(we have bought from them before). 3 truckles of cheese and 2 chutneys later they moved on. Today is Saturday and it has been raining all morning. Time for baking! Managed to make 2 loaves of bread and some caraway biscuits that went very well with a little aforementioned cheese and chutney. After lunch we walked around Westport Lake as the sun was shining, the oatcake boat had moored by the lake. Luckily I had no cash to buy any. Oatcakes being a Staffordshire delicacy and looking like a pancake rather than the oatcakes we know. 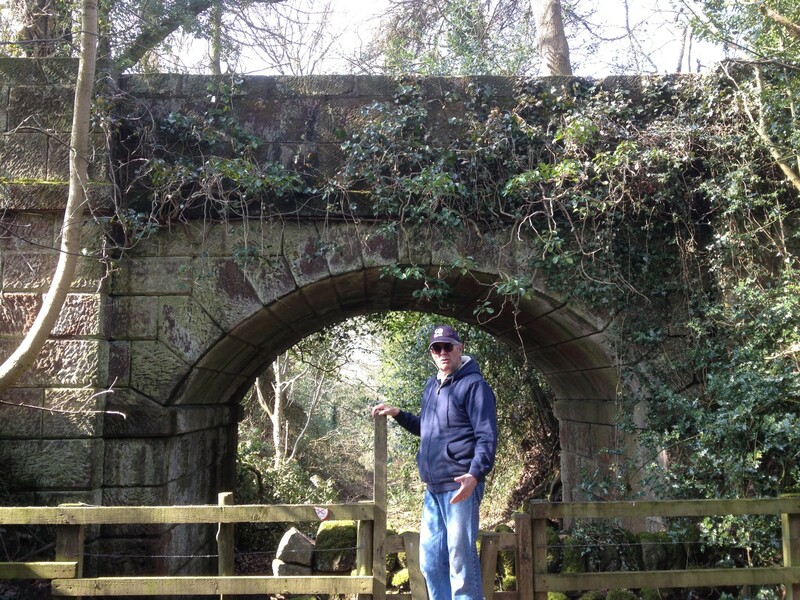 We then walked along the towpath to the portal of the Harecastle Tunnel. This is our next experience (if you can call it that). Looks like we will have to remove our topbox first though due to the gradient of the tunnel roof. I will let you know how we get on after we have done it. 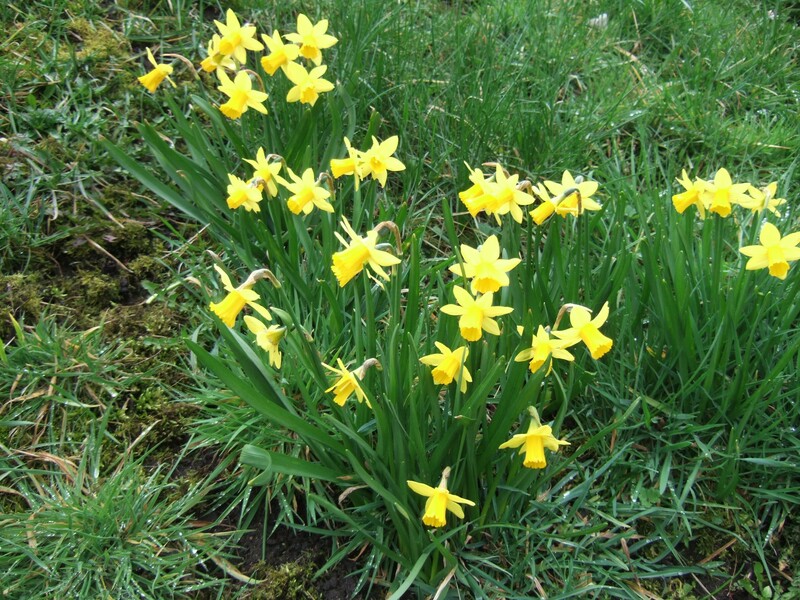 And to finish today’s blog some pretty miniature spring daffodils. Finally for the horse lovers some tack harness showing the row of coloured wooden beads that protected the horses flanks when negotiating tunnels. A well fed and watered horse could work an 18hr day pulling a butty boat. What a hard life for the boatmen also. It’s Sunday so we planned a trip on the restored railway. We left at 11.17 and travelled to Froghall station. Had a quick look around and returned to Consall for Sunday lunch in the Black Lion pub. Boarded the train again at 13.30, travelled back to Cheddleton. Stayed in train and did whole journey again as sun was shining and we were enjoying the views. Waiting room, booking office and old fashioned luggage. The steam train was out of action today so it was a 1960’s Diesel engine that pulled the carriages. Those of a certain age will recognise the interiors. Black Lion for Sunday lunch. Quite remote but very busy. They even sell provisions for boaters so I managed to get some milk. The railway is kept running by volunteers, is owned by its shareholders, and has backing from Pete Waterman who opened it after it’s restoration. A lovely reminder of days gone by. Couldn’t resist taking a picture of Breakaway from the train. We went on a route march to explore beyond the tunnel, as there are facilities marked here on our map. 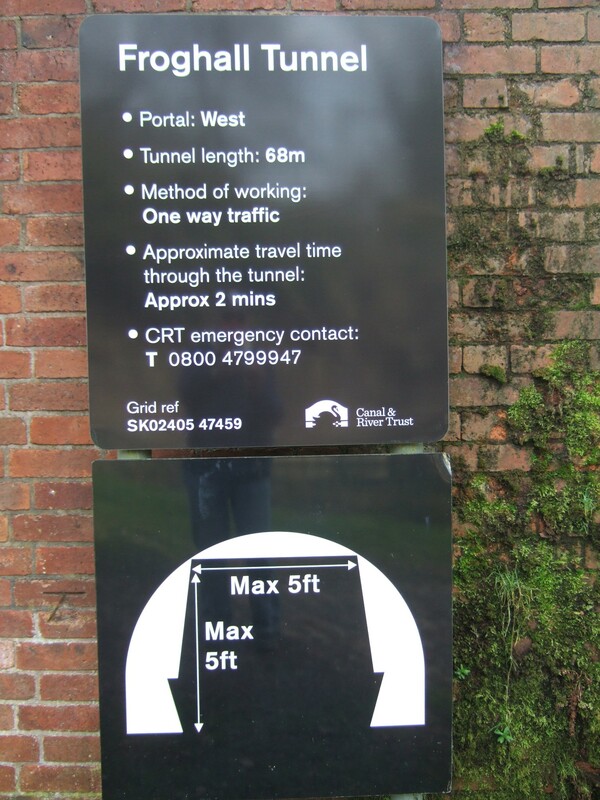 Tunnel safety notice and size gauge. We had a look around the visitor centre that seems to be getting ready for the season, and decided to take the Blue Walk around the surrounding woodland area. Supposed to be 2.5miles, but seemed longer as majority of it was uphill. Staffordshire moorland view, from the top of the hill. Back down again and looking in envy at this basin. 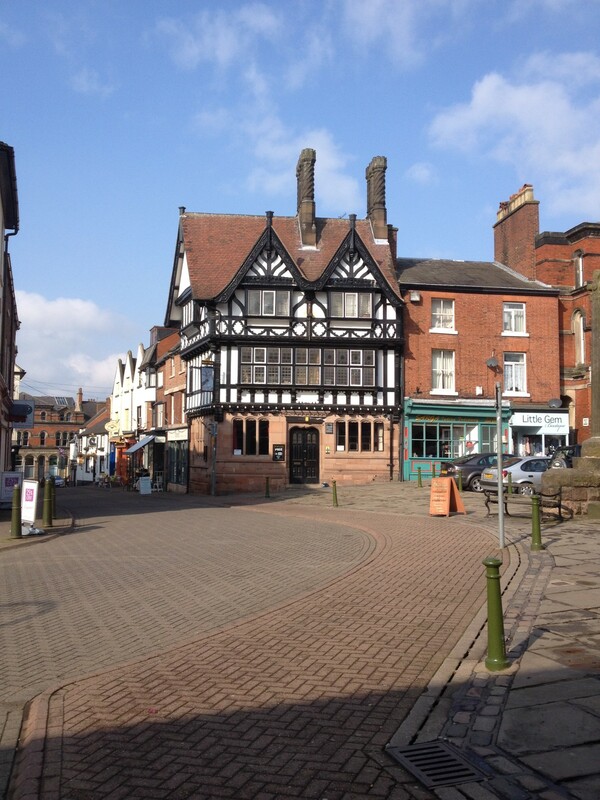 Uttoxeter basin that was finished after having money left in a will to complete it. How we wished we could have got through the tunnel to this idyllic spot. 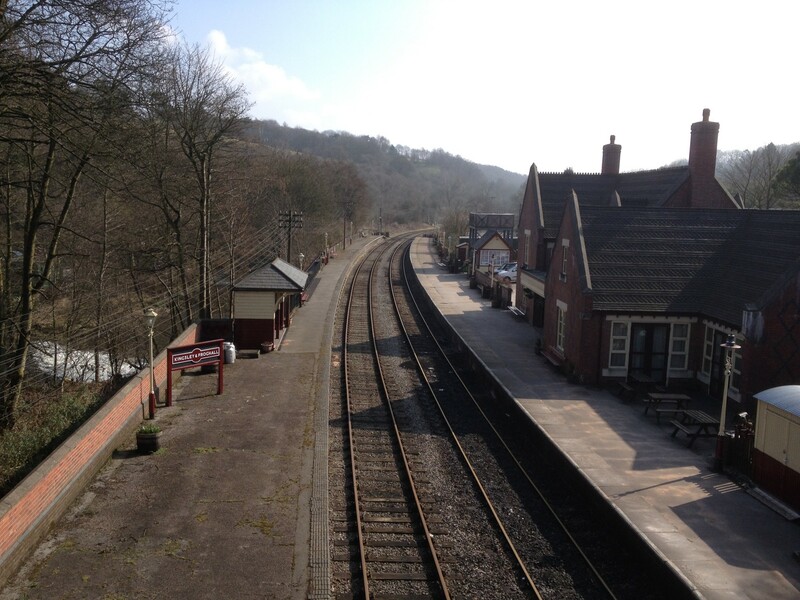 We then had walk to find the Churnet Valley railway station. 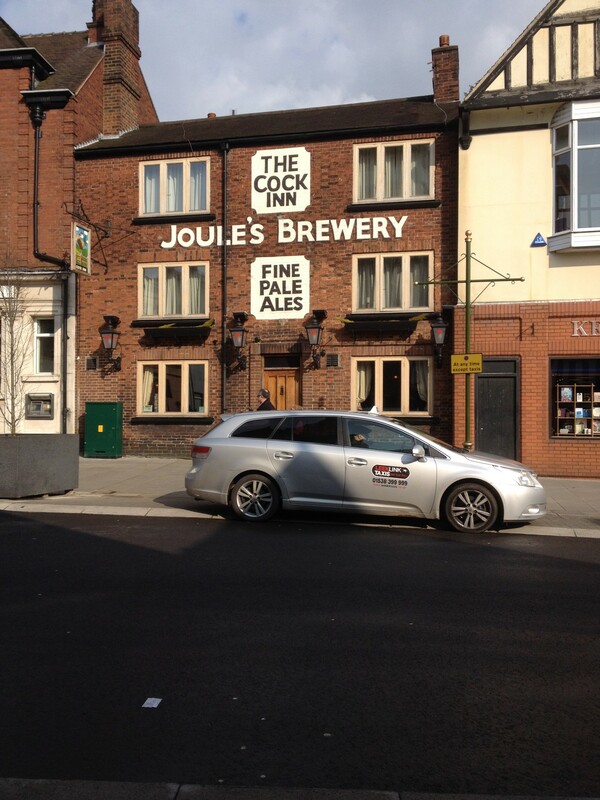 And there was a pub opposite, and it would have been rude not to have partaken of a pint whilst there, so we did. A little treat we don’t often do. But we weren’t expecting to today. We had planned to moor along the route and get here another day, but the moorings weren’t very good on route. It was either too narrow, overgrown, too shallow or taken by moorers with permits. The pictures that follow show a snippet of our journey today. 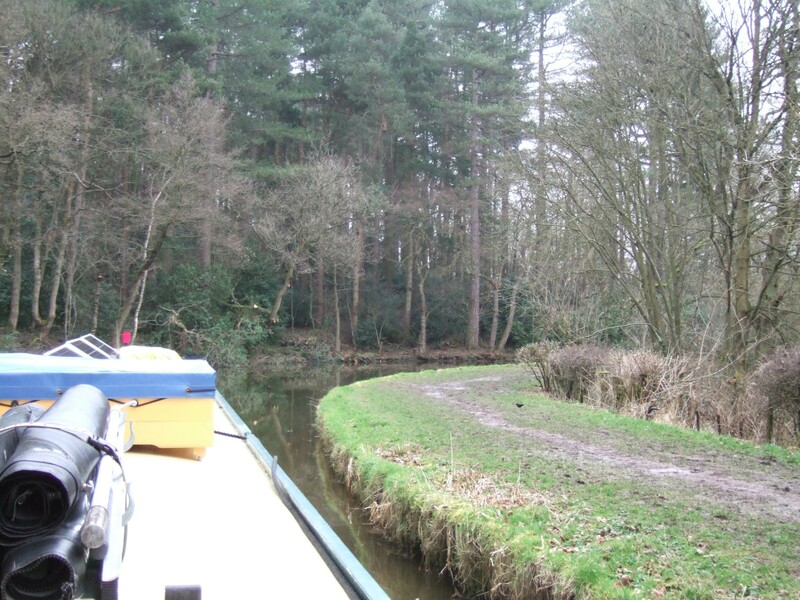 We have ended up on 24hr moorings at Froghall. 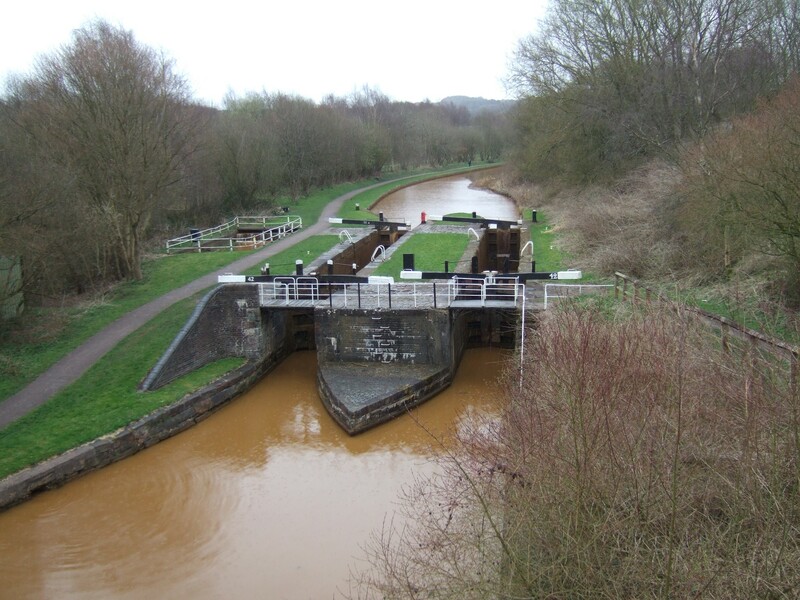 The first lock at Hazlehurst junction, a sharp turn right from the Leek arm onto the Caldon. 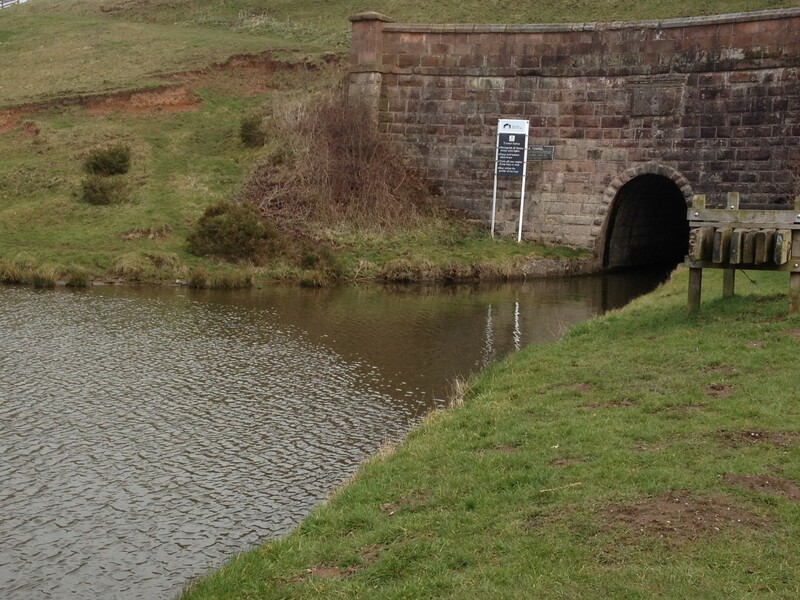 Hazlehurst aqueduct that carries the Leek arm above. Cheddleton Flint mill. 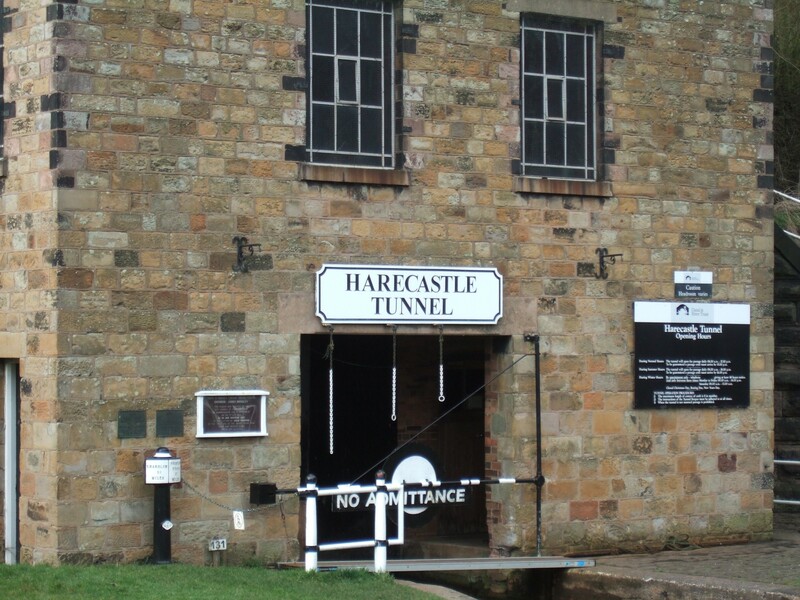 A visitor attraction that doesn’t open until Easter. Winding our way along the Caldon on one of the many bends. 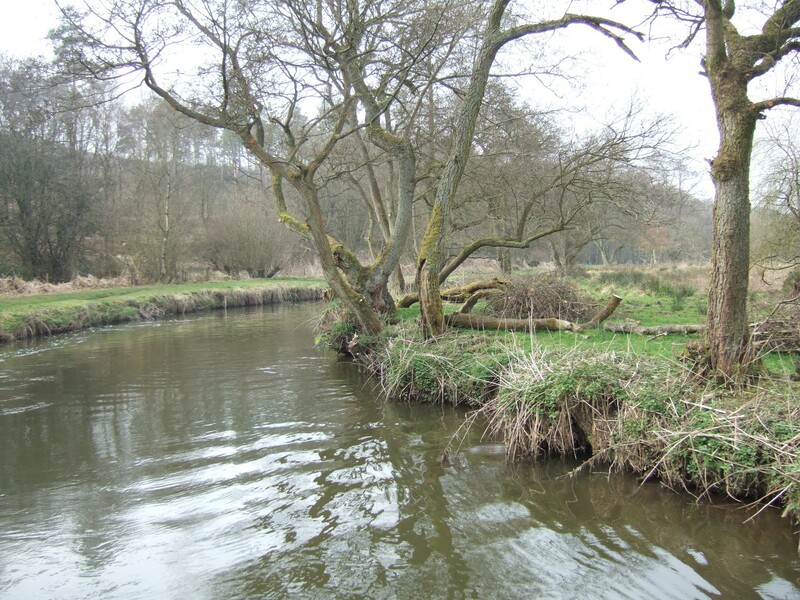 This stretch amalgamates with the River Churnet for about a mile. 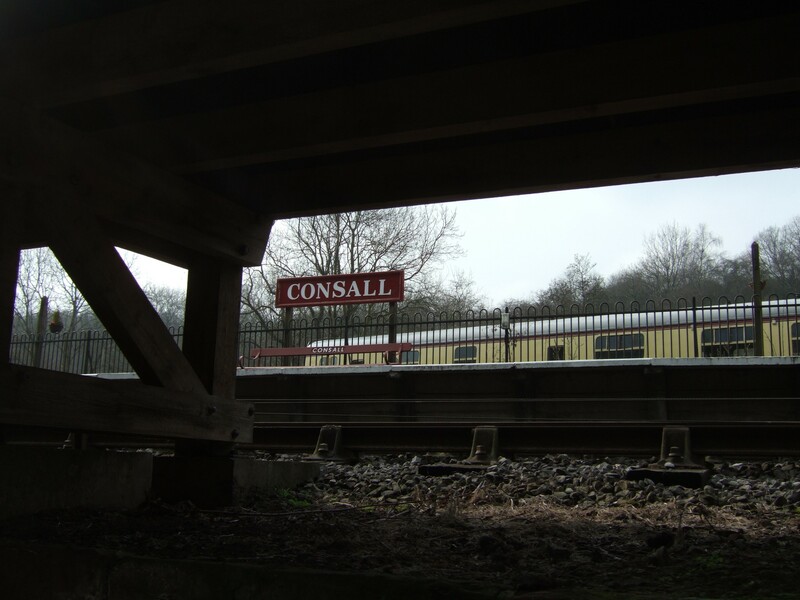 This is Consall station on the Churnet valley railway. Canal passes alongside and also underneath some of the station buildings. This is a preserved railway with steam and diesel loco’s. 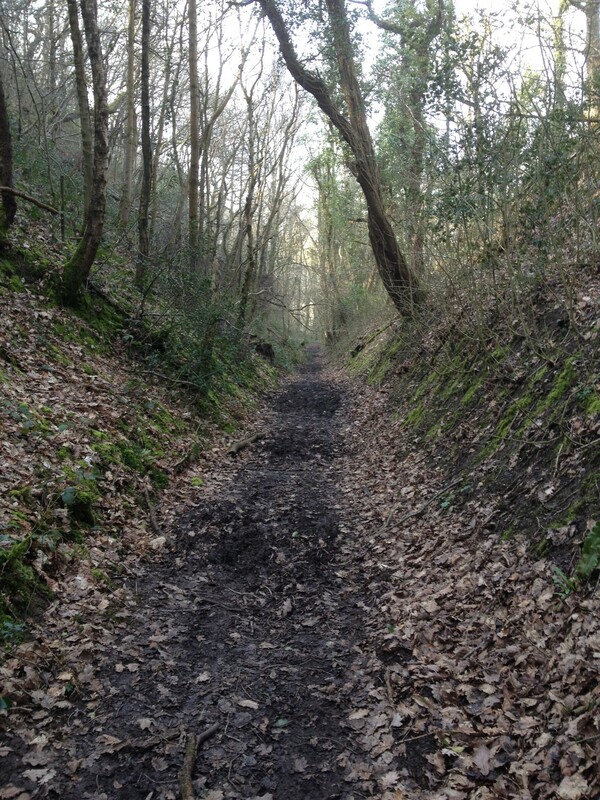 We hope to get a steam train on Sunday to sample the delights of the line, as it has the name of “Little Switzerland”. This excavation has been in the news locally recently, as it is an abandoned lock, found quite accidentally. This is next to Flint Mill lock, which has a loading gauge to check if the boat would get through the Froghall tunnel. As you can see we are too big for the tunnel, but we knew that already. 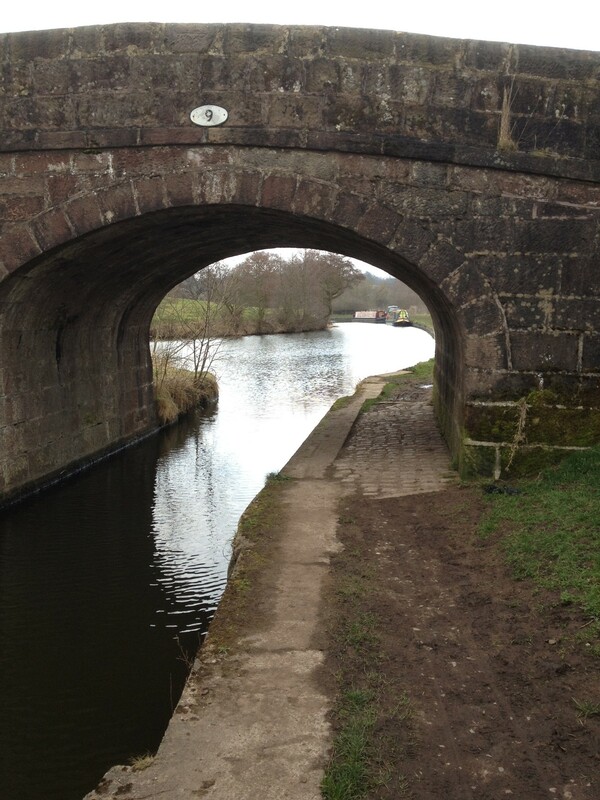 Just to show how narrow the canal is in places along this stretch. We are glad not to meet any other boats. We have been told we are the first to pass this way after the winter. There are many moored boats, but apart from some working boats nothing moving yet. Yesterday we had a bit of a disaster with our website! Charlie too keen to delete photos of the media, which in turn affected the blog. We were really told off by our IT expert who kindly sorted it out as best he could, and I think we have recovered most of the blog photos now. Been told not to do anything before consulting the expert! Today started with rain, but it soon dried up and as we needed topping up on provisions we decided to walk to Leek. Morrisons wasn’t too far away, but the walk takes you through an industrial estate which is a bit of a letdown after the tranquility of the canal. Anyway undeterred we carried on up a hill (after a little moaning from Charlie) and eventually arrived in the town centre. Leek derives it’s name from the norse word for water or spring, and it was a silk town, which gained a reputation for dyeing and embroidery. 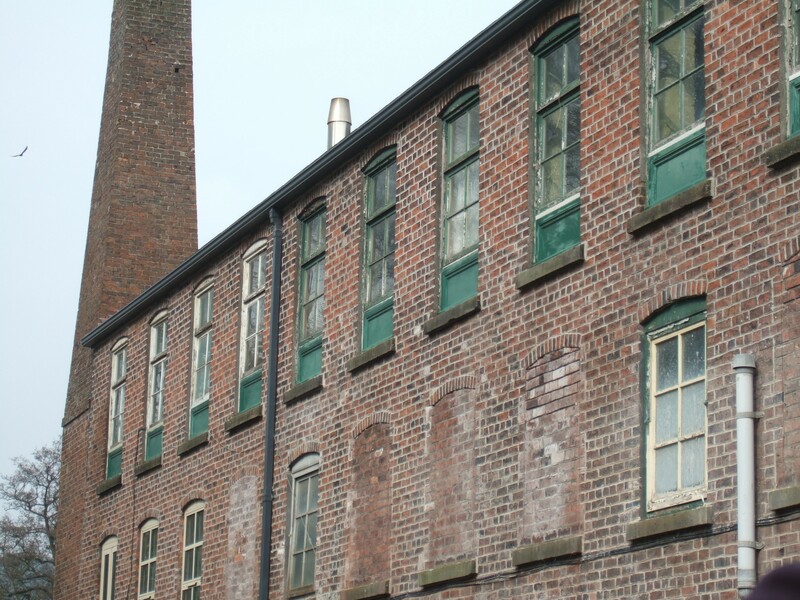 The Leek school of embroidery was founded here in the 1870’s by a Lady Wardle, and about the same time William Morris (founder of the arts and crafts movement) worked here. 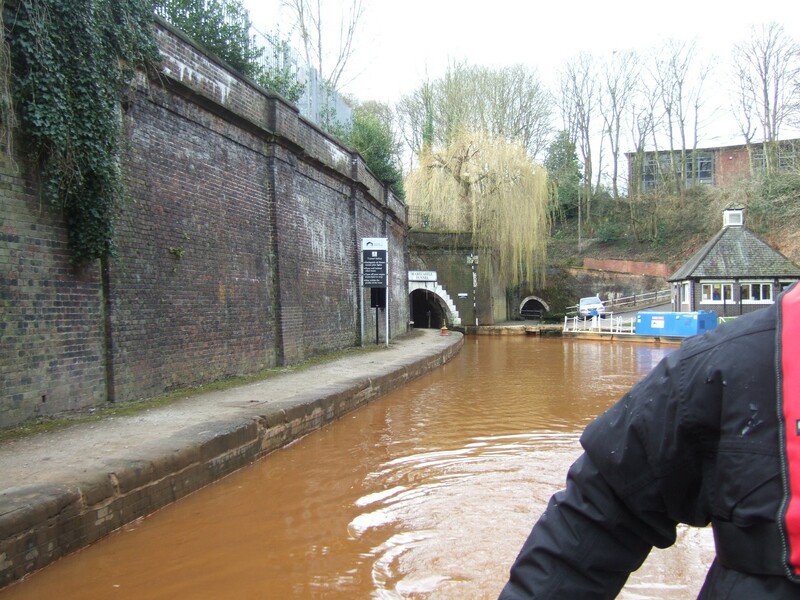 Also James Brindley the canal engineer started in business as a wheelwright in Leek. 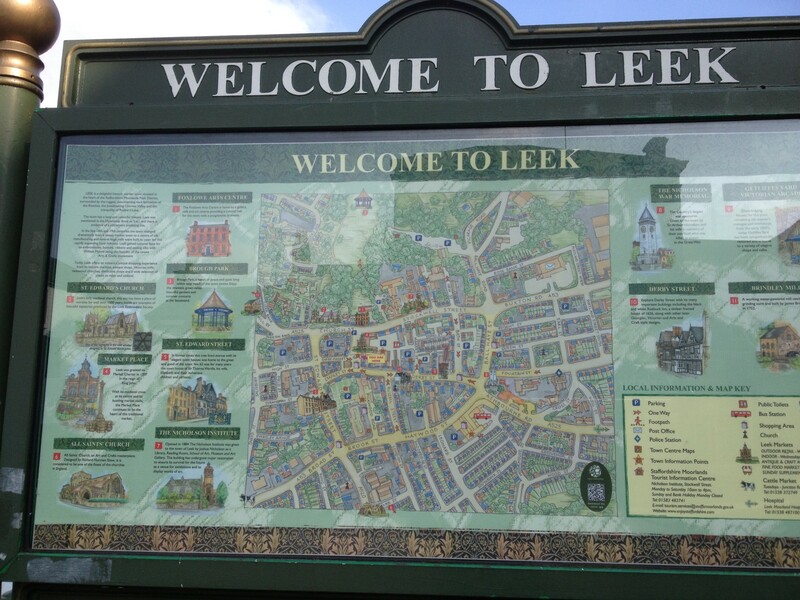 Information board in Leek market place. Parish church of St Edward built in the 14th centuty but restored in 1856, and the chancel in 1867. We had a good look around. There are many antique shops, charity shops (as usual) and a lovely mix of other more traditional shops that you don’t see much of today. We then ventured back down the hill to Morrisons, had a coffee, got some shopping and trudged home with our loaded trolley. 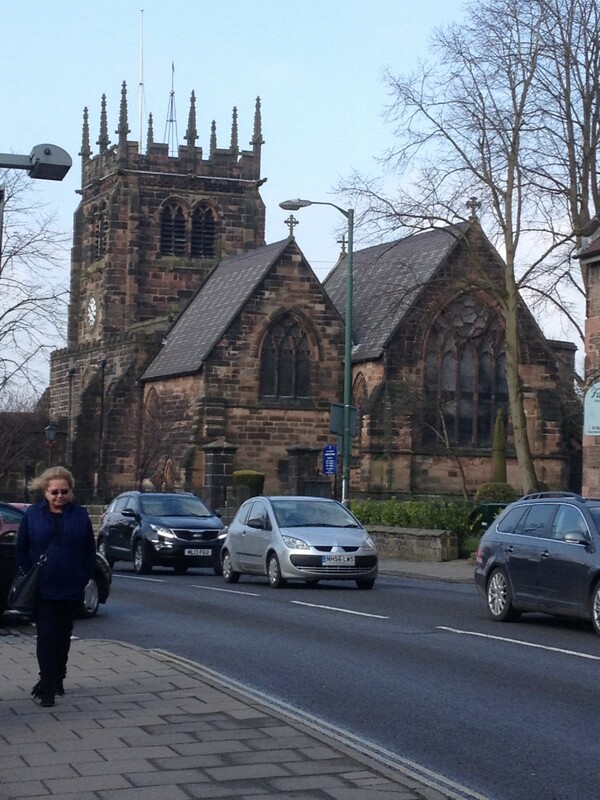 There is a Brindley museum not too far away but sadly like many interesting attractions isn’t open until Easter. 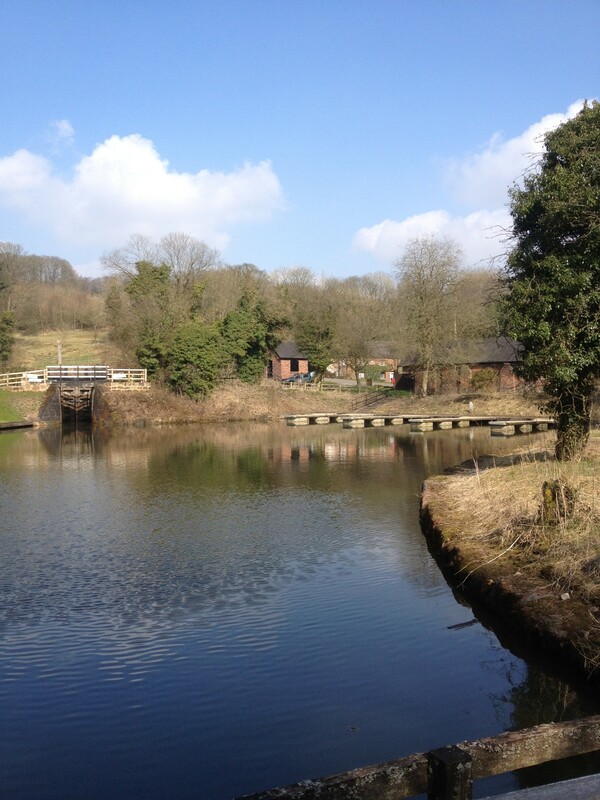 Tomorrow we will be moving back along the Leek arm to join the Caldon again as weather is set fair for the next 2 days. 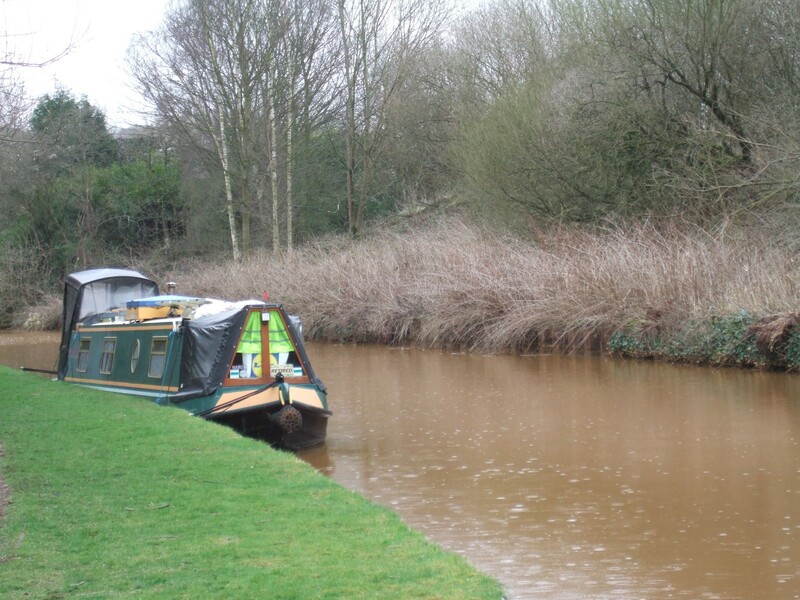 On Thursday we moved from Barlaston and headed for the Caldon branch of the Trent and Mersey. It was a long day travelling, but weather was dry. 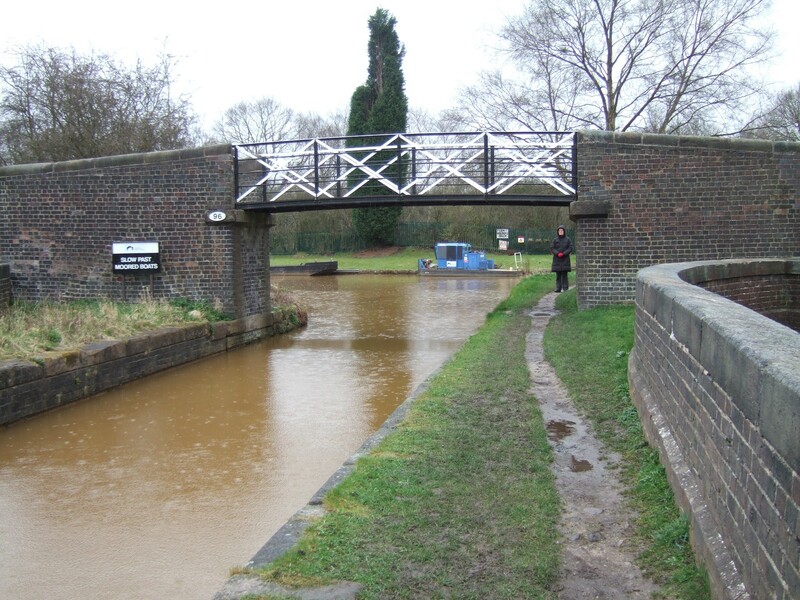 Along this stretch we negotiated Stoke Locks which are close together and rise approx 50ft. Etruscan bone and Flint mill by the lock. The turn from the T&M is very tight and there were services to empty elsan, rubbish and take on water just after the turn. 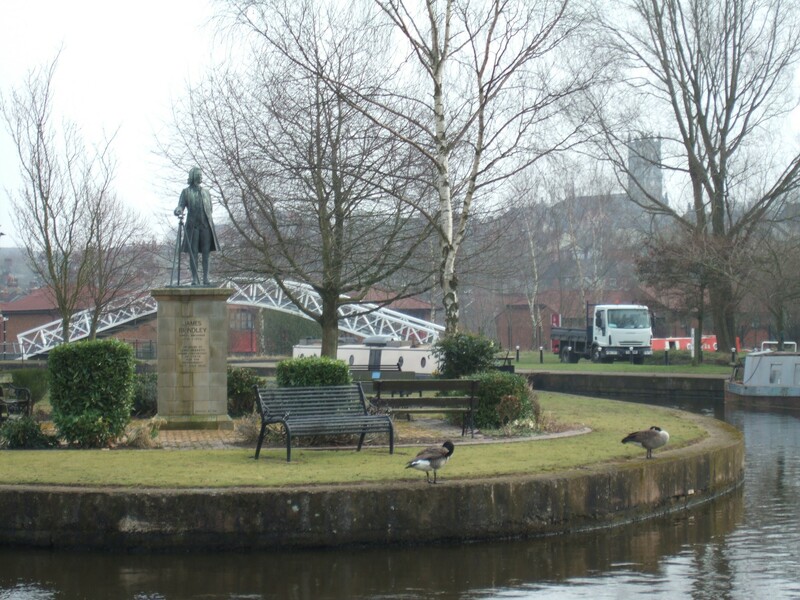 A statue of James Brindley overlooks this little basin, which looks quite pleasing with new apartments lining the route. 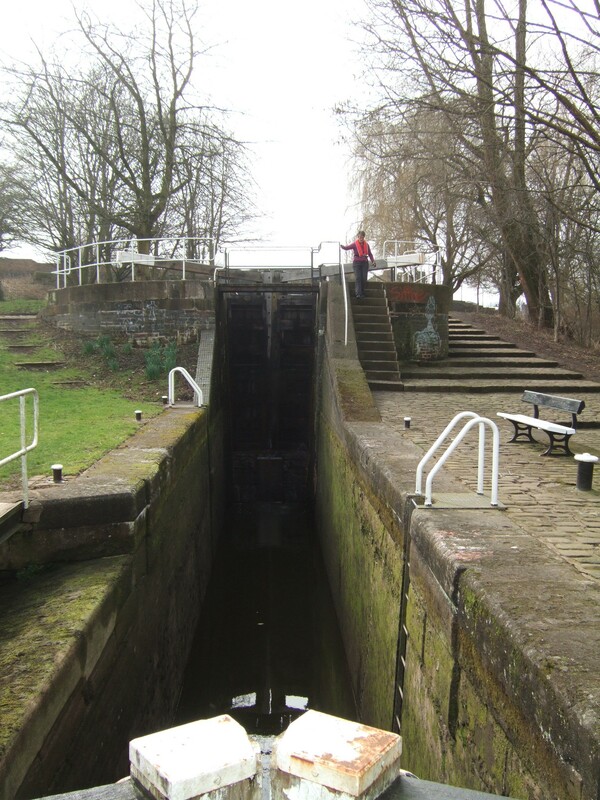 Next we had to negotiate a set of 2 staircase locks which were quite deep rising 19ft. Looking down at the gates. Pretty scary. 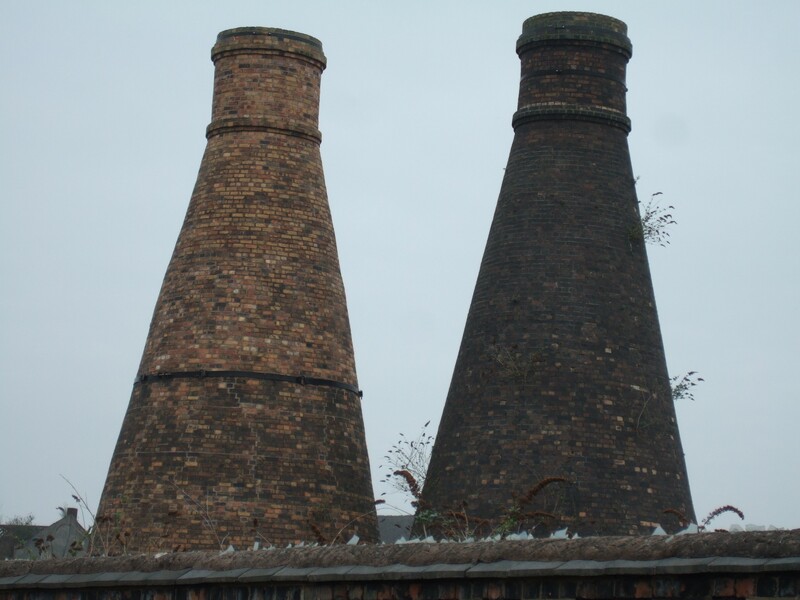 Disused bottle kilns, along the route at Hanley. Ivy House liftbridge which has been recently upgraded and all operated by pushing a button. This was negotiated after the locks. 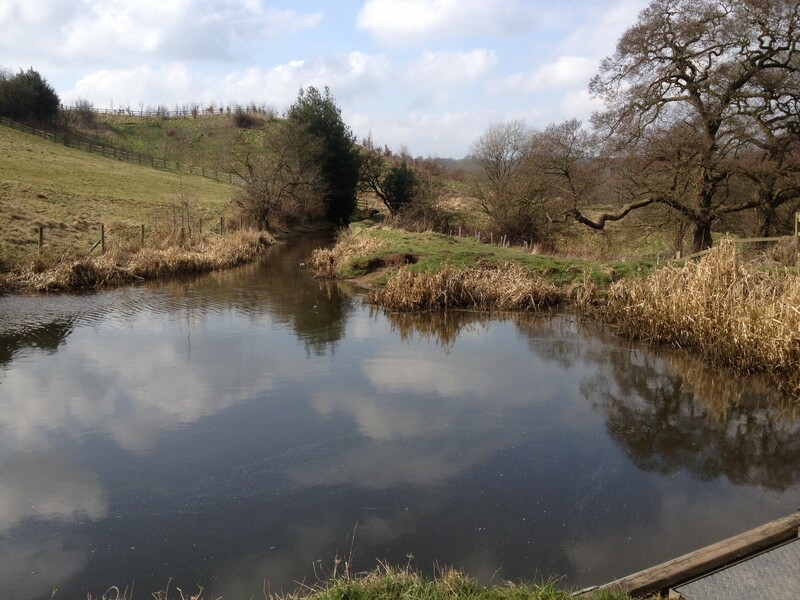 We then travelled along the Caldon for about 5miles through Hanley (one of the 5 towns that make Stoke), before we finally left the industry and found countryside. We stopped for the night just outside Milton overlooking a field with horses.,just before Engine Lock. Friday we shuffled up a bit more before the 2nd liftbridge. 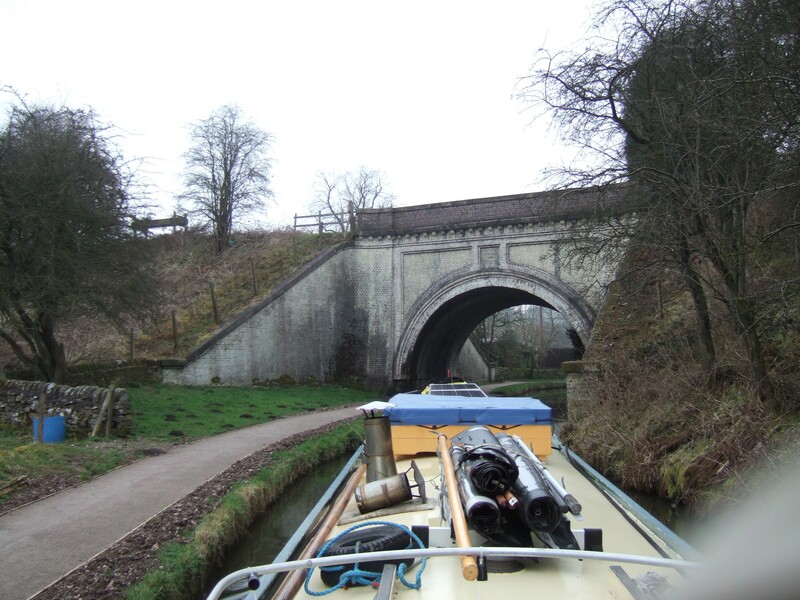 Saturday we decided to move to Endon, travelling through 2 more liftbridges that are operated by a windlass. 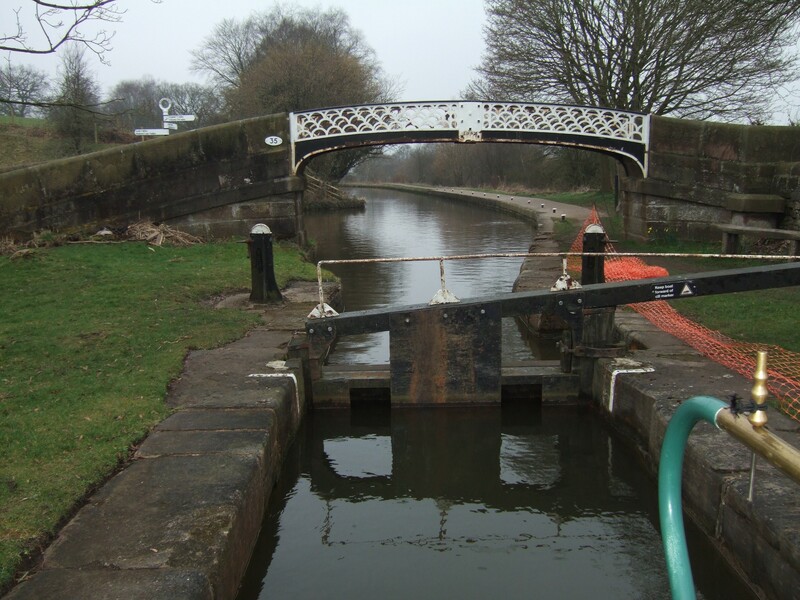 And also negotiating another flight of 5 locks at Stockton Brook rising 41ft. 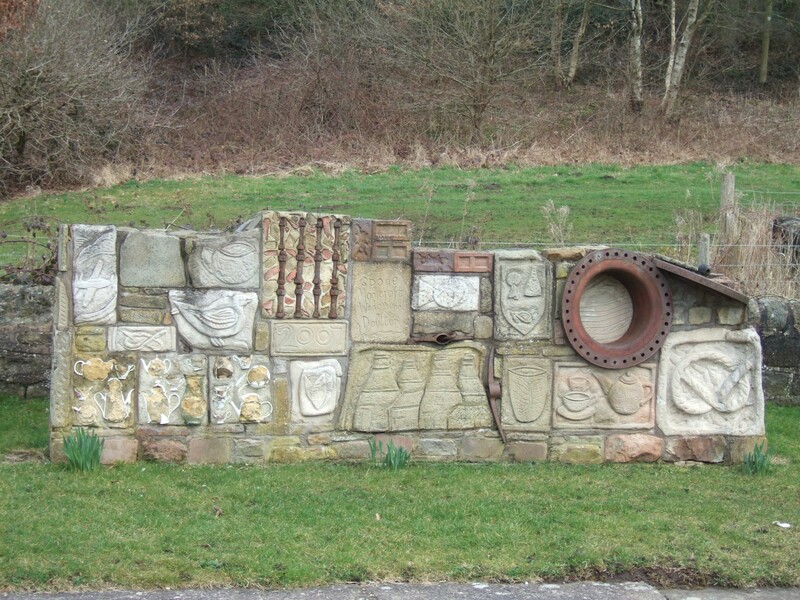 Artwork at Stockton Brook locks (shame the potteryware had been vandalised. At this point we hadn’t seen another boat and were told we were the first to pass through after the stoppages. We filled up again with water and partook of the elsan facilities and also cleared the weedhatch as much debris floating in the canal, especially through the locks. We couldn’t moor here as there were work boats taking up the moorings and also winter moorers. We travelled along and decided to turn onto the Leek arm, another interesting turn right, and all I can say after turning onto this stretch is WOW! 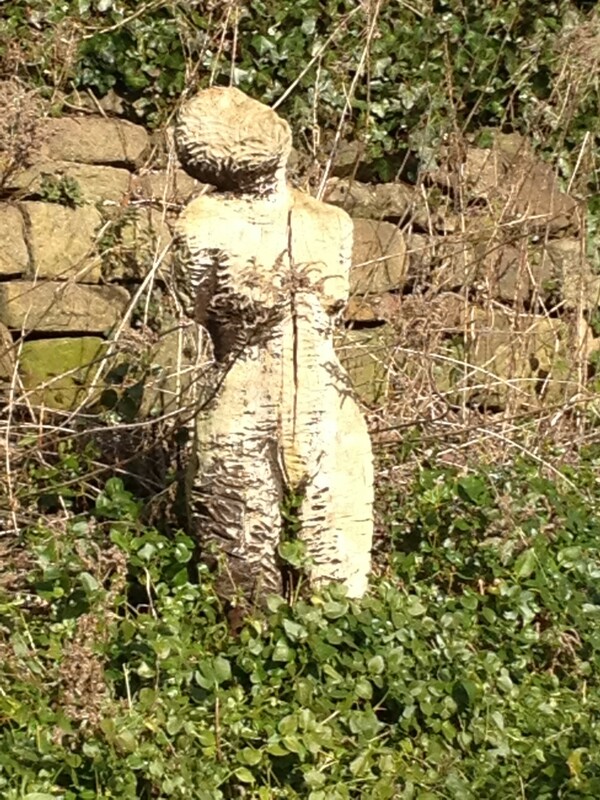 It is beautiful along here albeit narrow and overgrown with reeds, I bet it is lovely when the trees come into leaf. 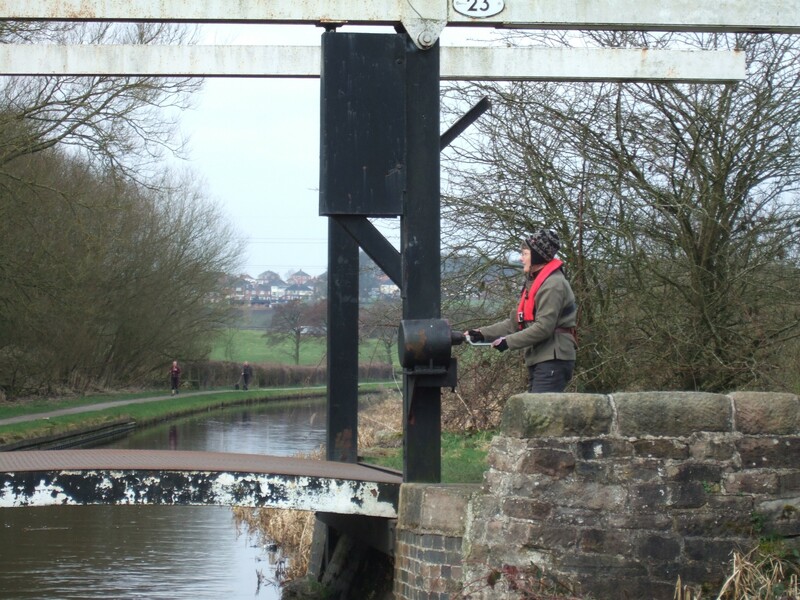 The canal twists and winds all the way along so concentration is needed at all times. We even scraped the bottom a couple of times. Winding along the Leek arm. Yes we do as inside the tunnel. 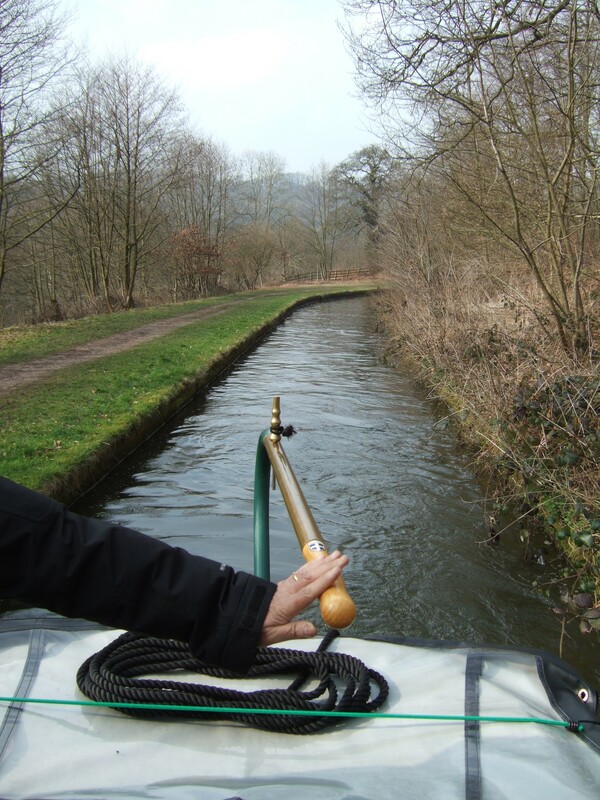 This is the end of the Leek arm, so we turned at the winding hole, reversed the boat and moored to explore Leek further. We were surprised to see 3 boats already here, but I think been here for a while. Last bridge with winding hole on the left. Breakaway first boat in the distance. 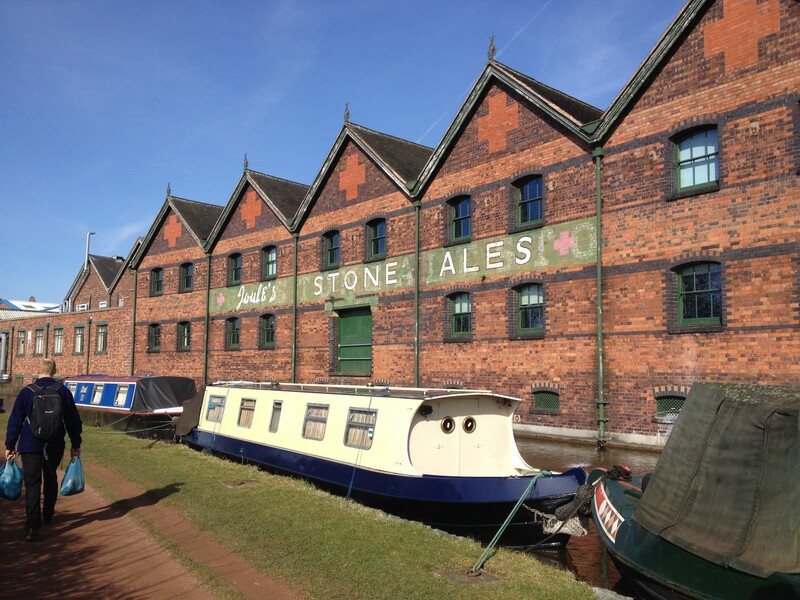 Lovely day today and as we had been moored for 5days in Stone, we decided to move further up the canal and get ready to get through Stoke. 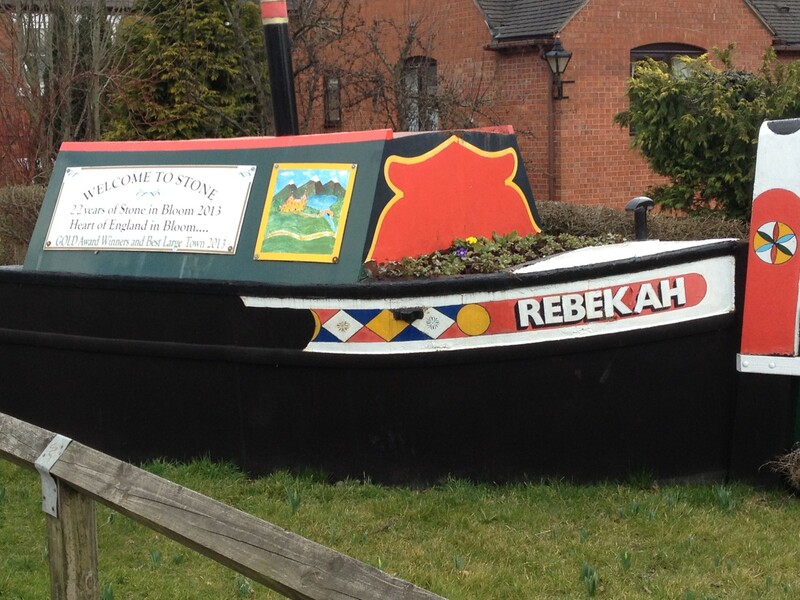 After 8 locks and 3hrs cruising we’ve made it to Barlaston. Our journey from Great Haywood to Stone was a memorable one. After emptying rubbish and elsan, and filling up with water at Great Haywood we set off and planned to do the 8mile journey to Stone in a day. The plan was to catch up with the washing whilst on the move, which we did (2 loads). About 3hours into the journey we had to stop as a boat was across the canal, it had become unteathered. Another boat coming down also stopped so we all helped to pull the boat in and tether it up. A phonecall to CRT helped locate the owner who duly arrived after the fun had stopped. This held us up for about 30mins, so we decided to stop for lunch and then carry on after. 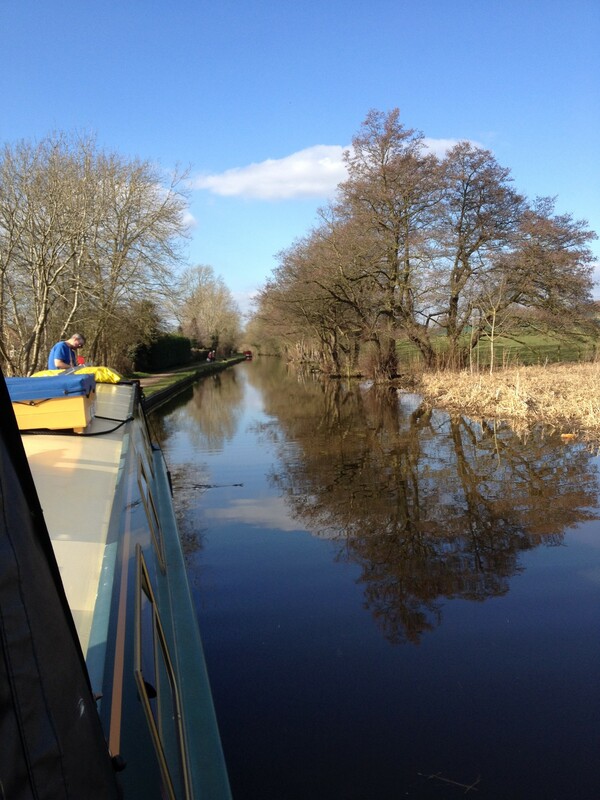 It was about 5pm when we arrived at Stone, and we managed to moor on a 5day mooring in full sunshine. 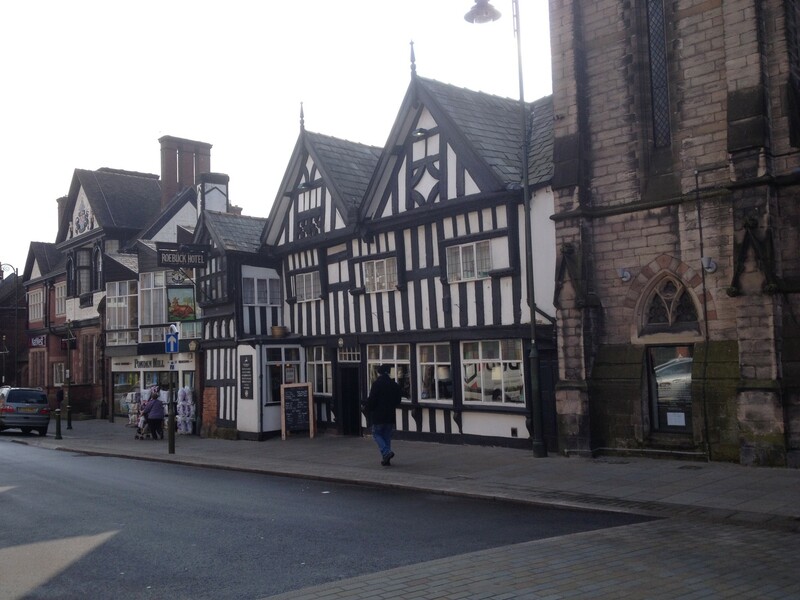 Today we had a stroll into the town centre to check on the amenities. Tomorrow will be stocking up on some shopping and apparently there is a farmers market there. 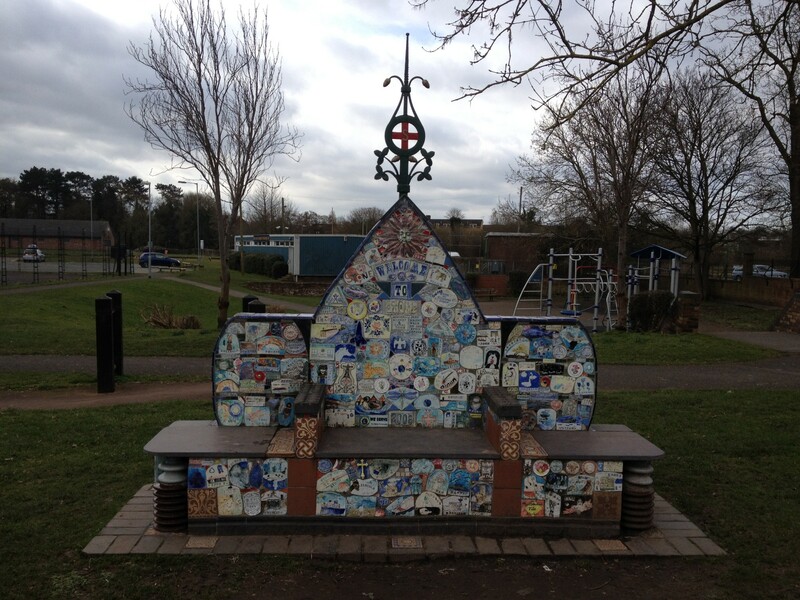 Lovely mosaic feature alongside the canal. 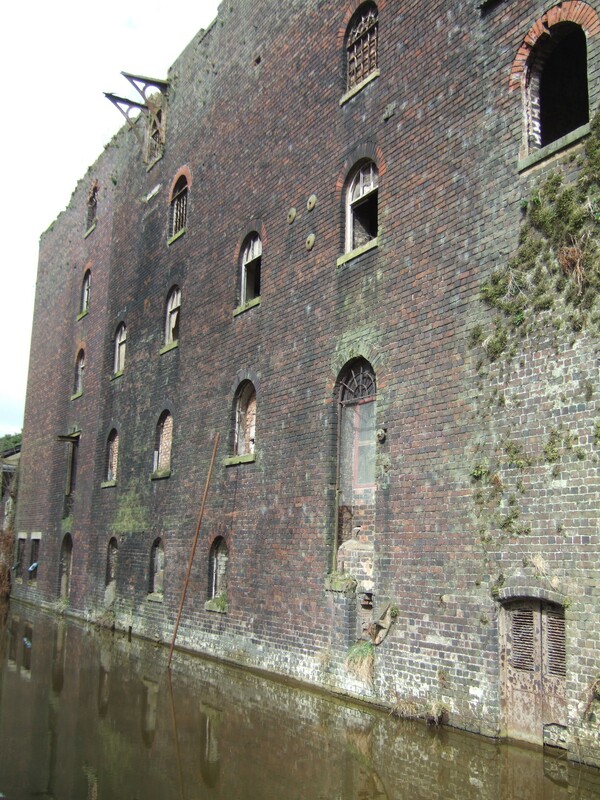 The old Joules brewery building that closed in 1970 after being bought by Bass Charrington. The statue below is by lock 94 and is called Christina. In memory of Christina Collins who was murdered by boatmen in 1839. She had paid 1 shilling and sixpence passage along the canal from Preston Brook to London so she could be with her husband. When she got to Stone she reported she was worried the men would meddle with her; sadly she was found murdered in the canal at Rugeley and her grave is in the churchyard there. It was a story that an Inspector Morse episode was based on.